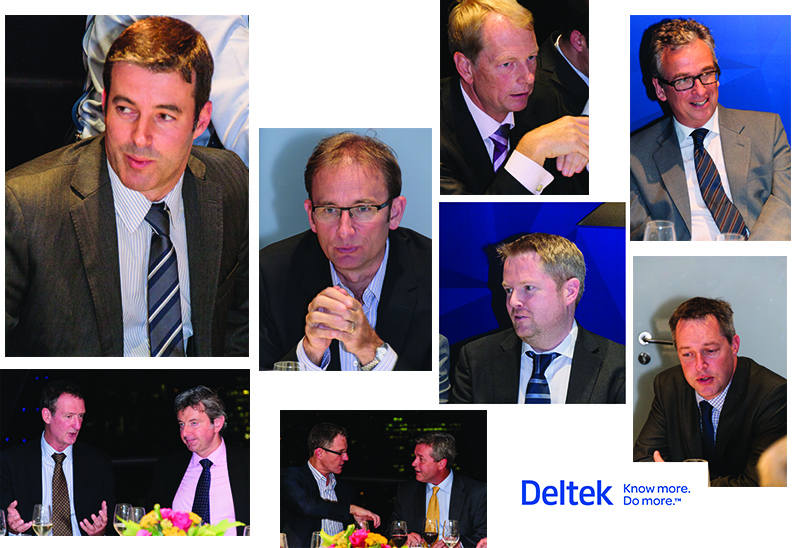 Large firms discuss delivering innovation and securing resources in a competitive and growing market, at our second round table event with software firm Deltek. Report by Bernadette Ballantyne. In a growing market where clients want to secure the best resources at the best prices, consultants are facing major challenges when it comes to winning work, resourcing projects and most crucially remaining profitable. These issues came to the fore in a discussion over the latest “Trends and Challenges in Architecture and Engineering” report conducted by software firm Deltek. In the study the company found that firms were increasingly optimistic over work volumes in 2014 with this dominated by organic growth. Of the 235 firms questioned 75% said this would be a feature of 2014 with 19 per cent of companies expecting acquisitive expansion. Evidence of this is clear with a raft of deals dominating the industry headlines in 2014, including AECOM’s purchase of URS in a deal worth around $6bn (£3.7bn). In early September Netherlands based consultant ARCADIS won a bidding war for consultant Hyder valuing the company at £296M, and WSP announced it had successfully beaten off rivals to procure Parsons Brinckerhoff for up to $1.35bn (£820M). Also in September UK consultant Mott MacDonald revealed its plan to buy long term joint venture partner Bentley Holdings. “As a business when we look at our forward order book today compared to a year ago it is certainly better than it was, in terms of volume and the scale of jobs,” said Mike Haigh, UK managing director for Mott MacDonald. He also noted growth was evident in overseas markets where the firm has 60% of its business. For some growth in the UK market was attributed to the pick-up in awards across regulated industries in 2014. “We are optimistic now because the regulatory cycles have all fallen together well for this year and a lot of public sector opportunities have also come to market, which if you are exposed to those markets have increased the volume, but it does mean that for some sectors there will be less contract awards next year,” said Richard Butterfield, director at Amey. “We are also seeing a lot more demand for asset management overseas. In the US and Australia there is a realisation that there are good things going on in the UK and they want to try it,” he said. Although firms were unanimously positive about the business outlook there was a feeling that this is concentrated in the south east with regional investment lagging. And in international markets firms pointed to infrastructure as leading the growth curve but said that property was recovering. At the same time markets that had been suppressed after the recession such as North America and the Middle East are seen to be rebounding. With growth evident, firms discussed the issue of pricing which 66 % of firms in the Deltek report said was the biggest threat to the industry. The discussion drew out concerns over the unsustainable behaviours of some companies suppressing fees. “The volume of opportunity is increasing in every sector that we operate in, however it is not infrequently that we find bid levels the same as they were a couple of years ago and that continually surprises me,” said Steve Canadine, managing director of Ramboll UK. At the same time consultants are being challenged to deliver more for less, particularly in regulated industries. Several participants pointed to the water industry where work has successfully been delivered 10-15% cheaper in successive five year AMP periods, and yet margins remain flat at 5-7%. “This industry does not capture the value that it creates, not even close,” stated Richard Robinson, director at AECOM. “As quickly as we innovate we give it away to clients because that gives us the edge and wins the framework for us,” agreed Haigh. Firms said this was partly because some clients were still operating in “recession mode” putting low cost above all else. Although relationships with clients remain crucial, companies pointed towards “transactional procurement departments” which focused only on price. In some cases this means that despite strong relationships with project teams, managers in the client organisations were being overruled on the basis of cost. This was considered to be less of an issue for private sector clients, but regardless of the ownership model consultants said that delivering to time and budget is no longer good enough. Peter Begbey, director of Waterman, said that firms were having to perform better than ever. “Our private sector clients expect a high level of client satisfaction beyond delivering what is normally required in relation to time, cost and quality. They place great value on our advice and relationships which have been built up over the years. We walk the extra mile, we provide a personal service and we add value through the planning and design process which is recognised through the high levels of repeat business we achieve”. This means having a better understanding than ever about the businesses and needs of client organisations. “If you can understand the value that a client needs, you can find better ways to do things and drive the price down and be more competitive,” said Cameron Cromwell, managing director infrastructure at Capita. Other firms agreed. “Growth will be constrained not by the sales, but by the ability to attract and retain the greatest talent in the industry,” said David Luscombe, director of sustainable building solutions at Parsons Brinckerhoff. Looking overseas the issue of margins remained a talking point with firms explaining that profitability and payment terms vary worldwide. South East Asia was noted as a region that could be slow to pay, affecting cash flow in companies with a lot of exposure. Similarly the Middle East is known to have slow payment terms, but at the same time can offer higher margins. With margins remaining flat across the industry much debate was had over the use of data and enterprise resource planning (ERP) software to help inform decision making and ensure profitability. “ERP adds benchmarking of data and processes so that you can actually use your data to see where you can improve margin. That is extremely difficult if you have different systems,” said Rolf Hansen, senior director for enterprise at Deltek. He also advised that the tool was used to support project management decisions and not just to run back office functions. “Where we see most success is where ERP is part of a wider change programme and a tool to aid better decision making,” he said. Consultant Ramboll is in the midst of expanding and unifying its ERP platform across its UK business. “We are genuinely looking forward to being on same system as the rest of the global business and I believe that will be very helpful,” said Canadine. Several firms pointed out that having the information to be able to understand not only the price base but how to challenge it and therefore bid smarter was vital to future profitability. “It is really important to have detailed knowledge about the sort of margins you have in different markets with different clients,” said Haigh. Other firms agreed but warned that overlaying this with sensitivity and intuitive pricing based on experience and client relationships was really important. “You have to know your clients, it is not accountancy systems that know the client,” pointed out Andrew Noble, financial director at WSP. Others agreed. “Good data is essential for good decision-making. Data helps you understand your client and be more sensitive to their business needs,” said Alex Tosetti, operations director at consultant URS. But AECOM’s Robinson was quick to point out that size is not the only issue. “It is about quality and excellence of delivery. Acquiring URS enables us to be excellent in markets that we are not in at the moment,” he said. At the same time some of the larger consultancies said that growing in size would bring them closer in scale to some of the major clients and “raises the bar” for the profession, bringing it in line with prize accountants or lawyers with a global reach. Firms said that not only were some consultants getting larger, client organisations and project opportunities were too, giving rise to more collaboration between consulting firms. This might be to extend global reach or to provide additional resource. “We are winning massive projects by collaborating with our competitors. We are not too proud to partner with the best in class,” said Tosetti. Other firms said that they deliberately sought smaller independent consultants to work with that were not affiliated to larger competitors, noting that independence was a currency valued by many clients. At the same time it was also noted that many of the clients in the UK were contractors with smaller global footprints than the consultants they hire. But perhaps most importantly for firms the business outlook for the industry is strong and on an upward trajectory. As the market adjusts to the new dynamics consultants are at the forefront of capturing innovation and deploying it for their customers. Those that can also apply some of this internally will be well placed to meet the challenges of the future. For the “Trends and Challenges in Architecture and Engineering” report Deltek interviewed 235 companies in markets all over the world including Germany, Austria, Switzerland, the Netherlands, Belgium, Denmark, Norway, Sweden, The UK, France , South Africa, Australia and New Zealand. 66% see price competition as the greatest threat to the industry compared to 52% in 2013. Staff retention was considered the biggest threat by 53% of firms compared to 55% in 2013.